Blend black gram with some water to smooth paste. Transfer into a bowl. Blend together green gram, green chilli and ginger with some water to smooth paste. Add this to the same bowl. Add salt and mix well. Set aside to ferment for 5-6 hours. Add turmeric powder and asafoetida and mix well. Grease idli mould with some oil and spoon in the prepared mixture into its dents. Place the stand in the steamer and steam for 10 minutes. Make more idlis with the remaining batter similarly. 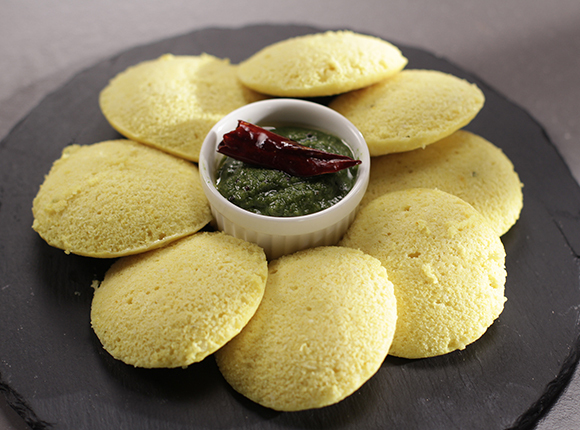 Demould and serve hot with green coconut chutney.